Correction: Motor oil is changed every 3-10K miles, not 15-30K. This is what happens when I trade driving for biking. Keep a faucet open to run water through your pipes during winter and avoid pipes bursting. Some of these lessons we learn from our parents and peers. Others we learn after something goes wrong—car engine seizes, pipes burst. Just this week I learned something that, in hindsight, makes complete sense. My bicycle tire burst (probably after hitting a pothole). The mechanic immediately, based on the snake bite pattern of the hole, that I don’t regularly inflate my tires. I simply didn’t know to do so on a regular basis. I would simply wait until the felt low and re-inflate. I’ve ridden bicycles since I was six. I’ve owned my current bicycle for about ten years. I’ve probably busted my inner tube in this manner at least six times. At no point until Thursday has anyone ever offered the simple advice of inflating my tires on a weekly basis. The next time you find yourself about to say something along the lines of, “You’ve gotta be stupid not to know…,” remember that common sense is not common. 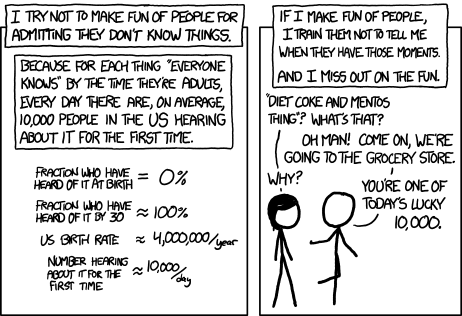 Also, here is an XKCD for good measure. In the spirit of spreading (relatively) common sense, XKCD comics also include a bit of extra text that is visible when you hover your mouse cursor over the image. I’ve included it as a caption for mobile/table viewers. Saying ‘what kind of an idiot doesn’t know about the Yellowstone supervolcano’ is so much more boring than telling someone about the Yellowstone supervolcano for the first time.